Danni's Dreams: Sending you sunshine! 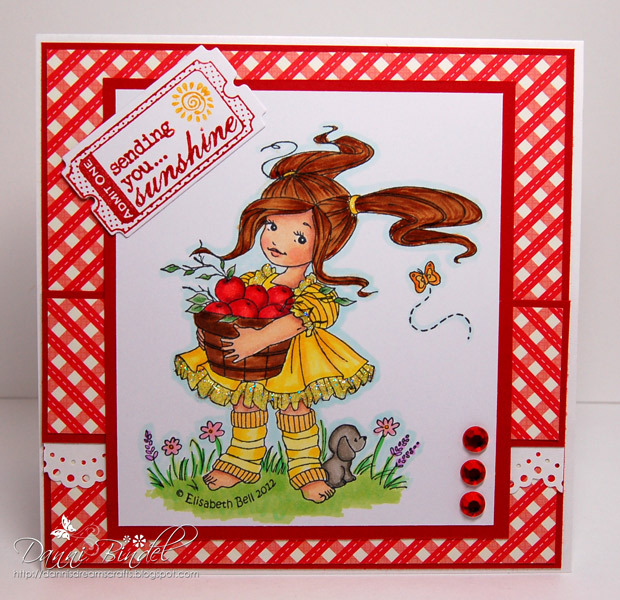 I made a card not too long ago with this adorable stamp, Apple Blossom, but truthfully I just didn't like the coloring job I did so I thought I'd give it another go. Happily I like how this time around turned out! :) I did find it interesting that I almost chose similar "tree" paper this time as I used last time, but in the end it didn't work with this version. I also used a sentiment from The Good Life Tickets set and the Ticket Die. Have a super wonderful day! I'm excited because today my new laptop arrives. I know it will be a huge learning curve but hopefully I can figure it out quickly. Beautiful card, love your coloring. Adorable, great color choices! The ticket sentiment is perfect....I'm going to have to check it out! AWE it is very Beautiful!!! I love her done up in Yellow! It is soo cheery and fun!!!! !